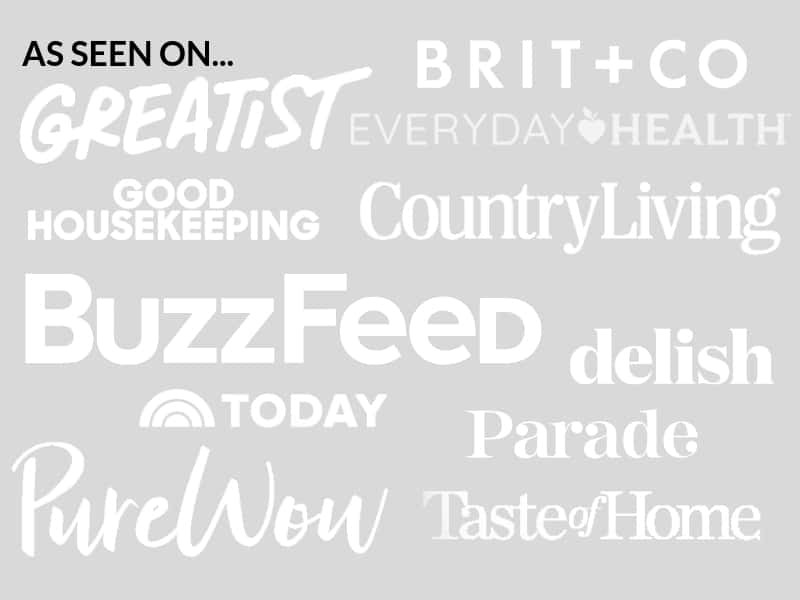 October 9, 2018 By Elizabeth Lindemann 3 Comments / This post may contain affiliate links. Walking in to your house after a long day of work and having the smell of dinner simmering in your slow cooker welcoming you home is one of the Best. Things. In. The. World. Especially when that dinner is butternut squash soup with curry and ginger on a crisp fall evening. This soup is vegan, super creamy, paleo/whole30 compliant, and packed full of nutritious ingredients. You’re going to love it! 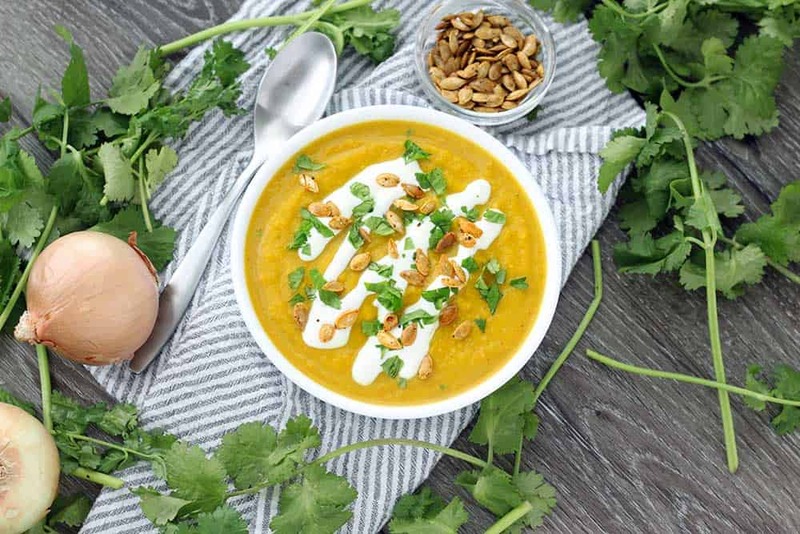 This butternut squash soup is so easy to prep a few days in advance. 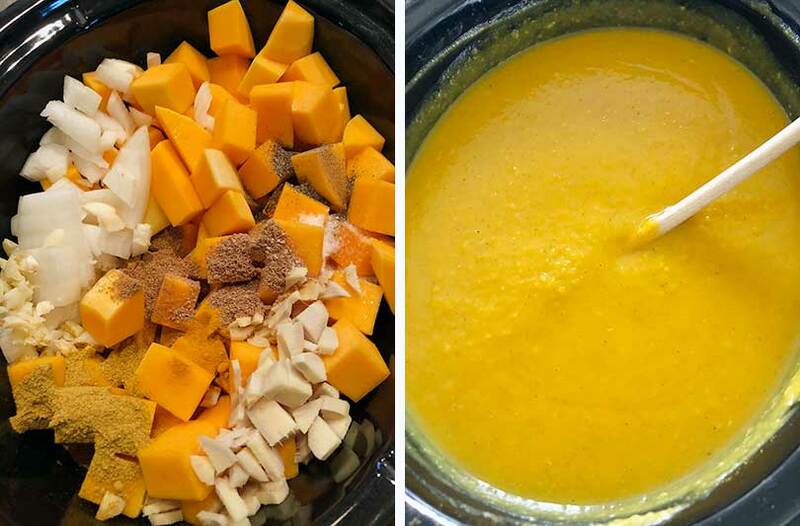 You can chop up all of your vegetables (butternut squash, onion, garlic, and fresh ginger) and add them to your slow cooker along with the spices (curry powder, coriander, cumin, turmeric, salt, and pepper). Then, on the day you want to cook, just add a can of coconut milk and some vegetable or chicken stock to the crockpot and cook! I cannot stress to you enough the importance of owning a slow cooker if you are a busy person who cares about eating home-cooked meals. Once your slow cooker has done its thing and the vegetables are super tender, you’ll need to puree it. You can use an immersion blender (which is what I used and is by far the easiest thing to do here) to blend it directly in the pot. If you don’t have one, you can puree the soup in batches in a standing blender, or you can even just use a potato masher for a more rustic consistency. 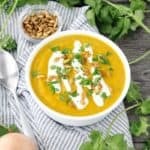 This slow cooker butternut squash soup is vegan, and it’s made creamy and rich by the addition of full-fat coconut milk and an awesome, flavorful combination of warming spices. It has ginger and turmeric in it, which have some amazing health benefits for digestion, to boost your immune system, and to fight off colds. 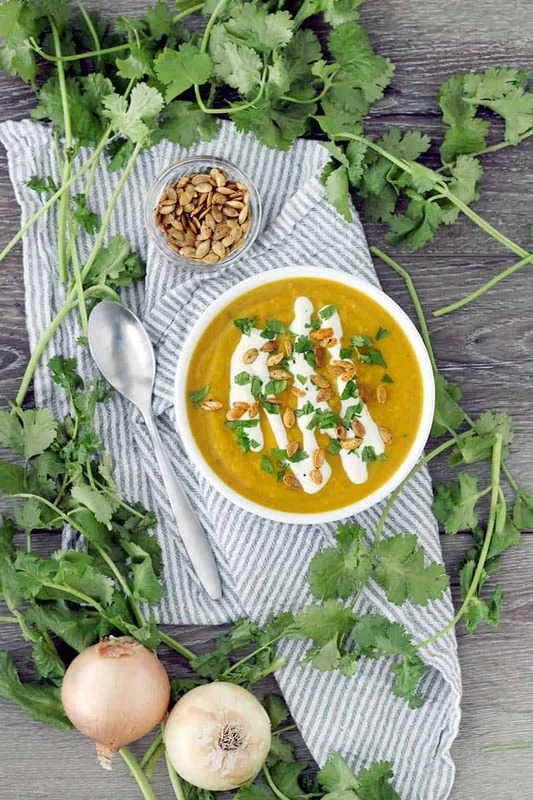 I like garnishing this soup with some tangy plain yogurt, fresh cilantro, and roasted squash seeds. When I prepped the butternut squash, I reserved the seeds. To roast them, just toss with a little olive oil, salt, and pepper, and spread evenly on a parchment covered baking sheet. Bake at 350 for about 20 minutes and you’ll have a super crunchy, delicious snack and soup garnish! 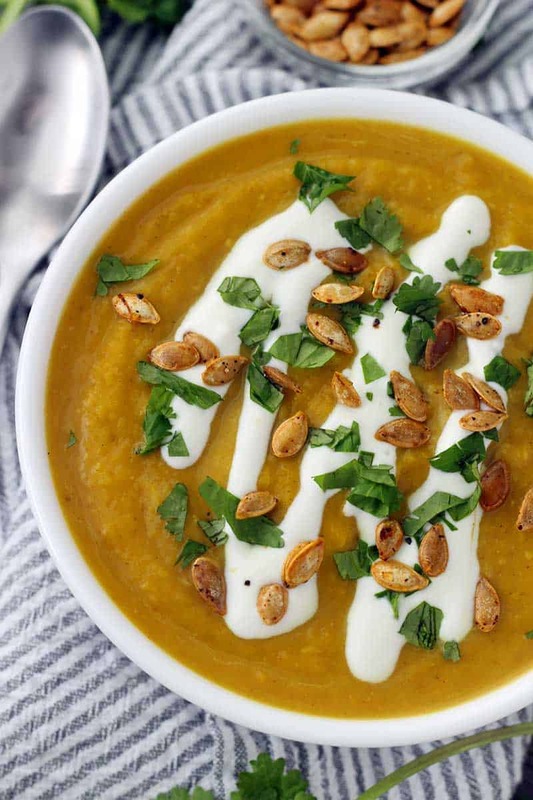 If you like this slow cooker butternut squash soup with curry and ginger, you’ll love this Butternut Squash and Red Lentil Soup, this Moroccan Butternut Squash, Chickpea, and Spinach Stew, and this Butternut Squash, Browned Butter, and Rosemary Fettuccini Alfredo. 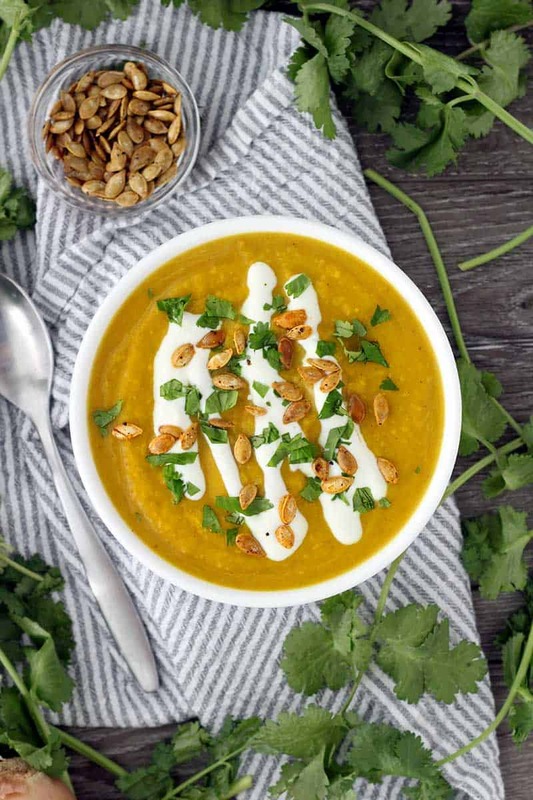 This slow cooker butternut squash soup is packed with flavor from curry, ginger, and other spices like turmeric. It's vegan, super creamy, and paleo/whole30 compliant! Combine all ingredients (except for cilantro and yogurt) in a slow cooker. Heat on low for 6-8 hours, or high for 3-4 hours, until squash is very tender. If soup is too thin, leave cover off of slow cooker and continue cooking on high for a while until it's thickened (or transfer it to a pot on your stove to simmer uncovered for a faster option). If it's too thick, add more stock, or water in a pinch. Freezer directions: You can store any leftovers in an airtight container in the freezer for up to six months. You can make this soup on the stovetop as well. Just sauté the vegetables in a bit of olive oil over medium-high heat until softened. Add the spices, stir to combine, and then add vegetable stock and coconut milk. Simmer on low for approximately 30 minutes, or until squash is tender. Blend as instructed above. There is no better feeling than walking in the door to the scent of dinner already made — love this recipe! Boy, I think this hits Lisa Vetne’s happy spot!